Please note that the stores pictured are not those referenced in the post. They are simply great images of stores I wanted to use for the blog entry. Last Saturday, I found myself with a little free time and decided to check out a game store in the Atlanta area that I had never visited before. One of those was a little shop I had passed a few times on one of my alternate ways to work (you know, when the interstate decides it’s not your friend). I parked my car, walked in, and after wandering around for a while found the board game section. Now this store was obviously a comic book shop first, which is perfectly fine. The board game section was crowded, but well stocked. There were several games which I had never heard of, which isn’t all that common, so I took some time to read boxes and do a little BGG research. Some games were hidden behind others, so I did a little shelf digging to find secret treasures. I even went and stood at the front of the store for a while, checking out the small box card games and the plethora of Munchkin expansions. All in all, I probably spent 20 minutes in the store. And never once did anyone say anything to me. On my way home, I just typed in ‘game store’ into my Waze app and found a shop I didn’t even know existed that was on the way home. 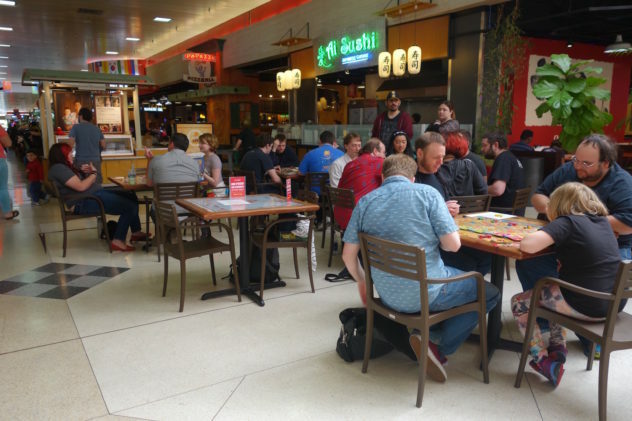 As I was walking up, I could see through the giant glass storefront that there was some sort of card tournament going on, and when I walked in it quickly became evident that Magic was the game of the day. This store was certainly dedicated to CCGs, as the board game section was limited to a very small part of the wall. In total, the probably had less than a dozen options for board games. Nevertheless, I picked up a few boxes, checked out the descriptions, did a little more phone research, and confusingly looked for a price on the boxes (none of these games had price tags). All of this merchandise was directly in front of the counter where three employees sat, talking a little about the Magic tournament but mostly just shooting the breeze, laughing, and having a good time. In the few years that I have spent really engaging in the hobby of board gaming, I have met quite a few game shop owners. Many of them have decried Amazon and big box stores like Target, as well as the board game specific sites like Miniature Market and GameNerdz. They consistently complain that they can’t compete with these stores, and that it’s so hard to keep expensive inventory and to sell games at higher prices when Amazon can short-sell them so well. I should mention that this usually occurs after I have approached the employees of the store and struck up a conversation. 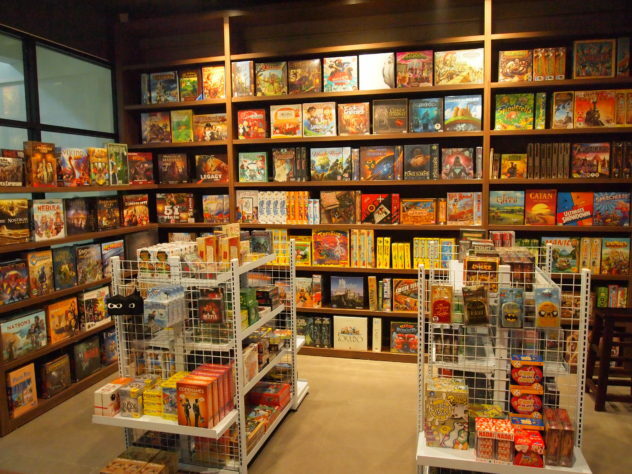 I would say that 70 percent of my time in board game stores has been spent in silence as I peruse the shelves, checking out the inventory and closely investigating games with which I am unfamiliar. It’s not because these employees are busy; often they are talking about a game, comic, or some other form of media while I am left to just wander around. Now, do I really need help? Not really. I generally know the inventory, and I know what I’m looking for. However, that’s probably not the case for many of the customers. Yet these business owners do not seek to establish any connections with their customers, instead choosing to talk with a few regulars that are constantly in the store. I’m very disappointed that this is how these representatives of our hobby are doing their jobs. I wonder how much bigger our hobby could be if board game stores were seen as happy, lively, welcoming places instead of the sad, dark dungeons of humanity that some of them have become. I wonder how much better these stores could be doing if they operated like businesses instead of clubhouses. Now don’t get me wrong, there are definitely some good stores out there. I personally am a huge fan of Tyche’s Games in Athens, Georgia. Each time I have gone in that store, I have been warmly welcomed, asked if I was looking for something in particular, and had games recommended to me based on my interests. It’s where I first learned about the game Cat Lady, which I purchased after playing and then went on to play nine times over the course of a week. 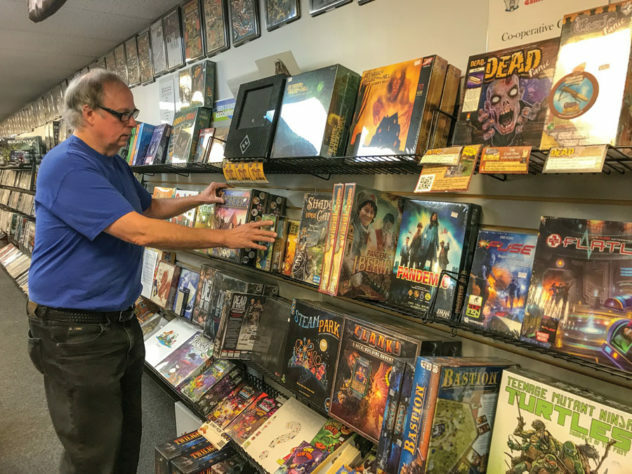 The space is small and intimate, covered wall to wall with games to the point of being overwhelming, yet the owners do everything in their power to help you feel comfortable and get you to find that perfect game to add to your collection. Until this type of behavior becomes the norm, I fear that board gaming will always carry a bit of a stigma. I know that some hobby gamers enjoy this feeling, getting a sense of superiority from playing games that are misunderstood by most people. But for me, gaming is all about getting people together and having a good time. If we can get the way that stores operate to change, maybe we can get gamers to change. Maybe we can get rid of the smug feeling of superiority that is often carried. Maybe I will feel comfortable bringing my wife to a gaming convention, knowing that she will be treated well and respected despite not having a deep knowledge of board games. Maybe that can happen.